Thirty years after being shut down, the cinema located in the old Army House returns as Kino Armata with film screenings and a variety of activities for film and music buffs. Hidden in plain sight in the dead center of town, just a few paces away from Grand Hotel, an unassuming doorway leads to a movie theater – and a former popular gathering spot – that has been inaccessible to the public for about 30 years. 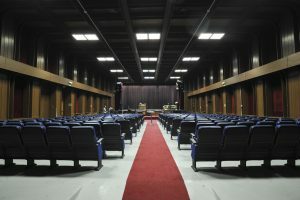 Kino Armata, a new cinema carrying on the legacy of the old cinema within the Army House (Shtepia e Armates), will officially open on Friday evening after management of the space was granted to the Municipality of Prishtina by the government of Kosovo. The first step towards revitalization will be the screening of ‘The Cabinet of Dr. Caligari,’ a silent movie from 1920, coupled with tunes by ambient music band Tetris. Alush Gashi, who is heading the revitalization process, said that the cinema used to be an important gathering spot in the city when he was young. “They used to show films starring Bruce Lee, Bud Spencer, Terence Hill and other such actors. They also showed cartoons, like Asterix and Obelix and commercial films from the ‘80s,” he said. The building where Kino Armata lies was constructed after the Second World War and was designated for the Yugoslav People’s Army, which later established the cinema within the compound and opened it to the public for screenings and events. The cinema closed between 1988 and 1999 due to the political and social situation in the country, which deteriorated rapidly after the revocation of Kosovo’s autonomy in 1989 and particularly once the Yugoslav wars of the1990s began. “I guess the situation was such that they didn’t want people to gather,” said Gashi, recalling the events of that time. After the Kosovo war in 1999, the building was taken over by the United Nations Mission in Kosovo, UNMIK, until the country’s declaration of independence in 2008, when it became the headquarters of the European Union Rule of Law Mission in Kosovo, EULEX. The railings and barbed wire that surrounded the building after the war were cleared away by the municipality in April, 2017, and EULEX eventually vacated the building the same year, passing it over to the Kosovo government. Now that it is open for all to enjoy, he said that the program will increase incrementally until things are settled. “We have a video projector at the moment, but it is not a cinema projector… we will try to get licenses to screen movies, but until that happens we will play movies that are in the public domain,” he said. Calling it an arthouse cinema, Gashi said that Kino Armata will be a space for many types of artistic expression, and that it will not necessarily be a competitor to other cinemas. “We also want to have music, the stage is phenomenal. We have contacts with many bands, but the goal is not to bring them from abroad, it is to stimulate local bands as well,” he said. Considering the history of the space, Gashi said that the intention is to make the cinema as inviting as possible. “It would be a good idea to have monthly meetings with people… the program and function of the space will be designed based on the interests of people,” said Gashi, adding that one such meeting was already held last week. On top of that, Gashi said that a longer term plan is to have Kino Armata be a platform for discussions and talks, driven by the interests of the citizens. Regarding the interior of the space, marked by a contrast of royal blue seats and brown, wooden plank walls, Gashi said that for now it will remain unchanged for historical preservation. Kino Armata’s official opening is scheduled for Wednesday, April 25, at 7:00 pm.